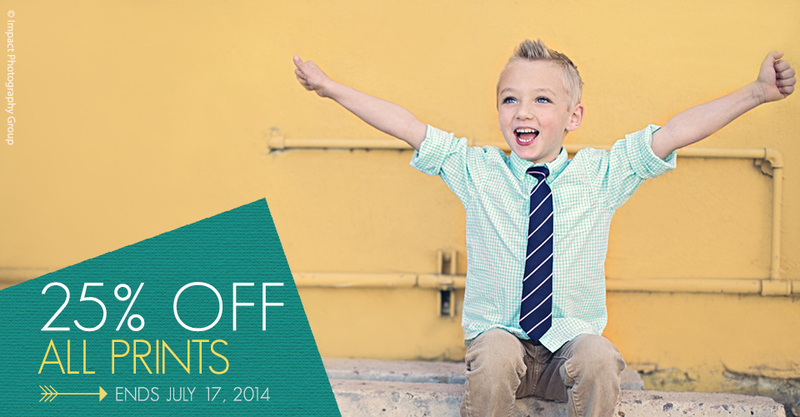 Now through July 17th, save 25% on Prints ordered through ROES or Remote Suite PLUS Print Products. From mini-wallets to 30x40s, this automatic discount applies to all photographic papers (E-Surface, True Black & White and Fuji Pearl) and sizes. Finishing Services are not included. Please Note: This sale only applies to orders placed through ROES and Remote Suite PLUS Print Products. Prints ordered via Proofing, Sports & Events, and School will not be discounted. The sale price will not be reflected in order summaries and email confirmations. The discount will only appear after the order is transmitted and received by the lab. No refunds on orders placed prior to the sale. Offer expires at 11:59 p.m. Central on July 17th, 2014. This is great, just in time for a sample I need. But does it mean that I can still order it mounted, its just that only the print cost will be 25% off? Hi Margiee. The sale does not apply to orders placed via Proofing, Sports & Events, and School. Orders will only be discounted when placed through ROES and Remote Suite PLUS Print Products. We apologize for the confusion, Shaun. The discount should appear correctly when you are invoiced.